Seen at the Korean Cultural Centre (KCCUK) during the Lim Soon-rye (임순례) month of KCCUK’s Korean Film Night programme “2012: Year of the 12 Directors”. 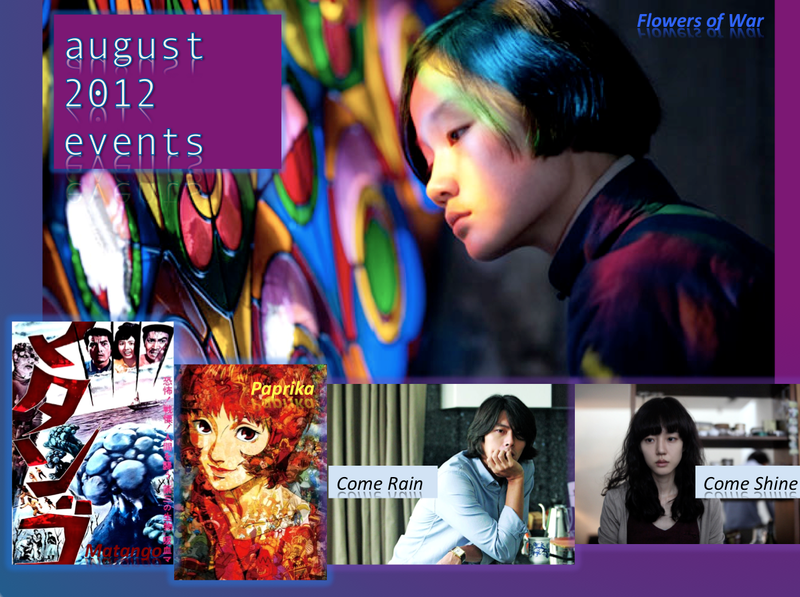 The Korean Cultural Centre in London (aka the KCCUK) gave Korean cinephiles a special treat in 2012 with the Year of 12 Directors: one Korean director for every month of the year, four screenings (most of them free) for each filmmaker, with a bonus for the final session: a Q&A event with the director of that month flown in straight from South Korea. Seen at the Korean Cultural Centre (KCCUK) during the Song Hae-seong (송해성) month of KCCUK’s Korean Film Night programme “2012: Year of the 12 Directors”. It’s the final month of the KCCUK‘s Year of 12 Directors (and, yes, it’s already more than half-gone-by). I don’t really want to believe it either, for one because it means 2012 is nearly over but also because what in the world will we be doing on Thursday evenings starting from January on? I’m hoping the KCCUK will still organise some film screenings, but I’m guessing it won’t be quite as many as this year. December, December… the year is coming to an end and at least in this part of the world people are sort of busy with Christmassy things. This also means that there is relatively little going on in terms of film festivals and film screenings. I couldn’t find much at least – do give me a heads up if you see anything I missed or if you hear about any new events being organised. 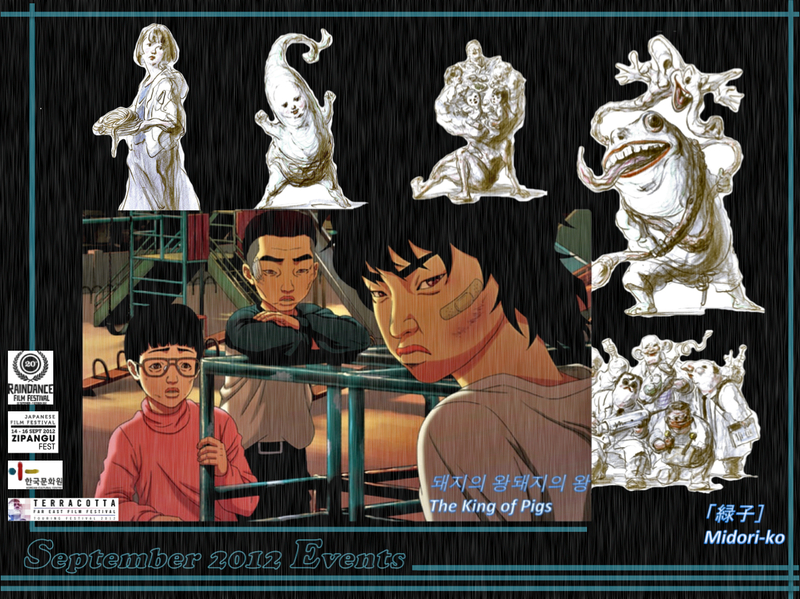 November may be filled with plenty of Korean cinema already – thanks to the London Korean Film Festival – but there is more film fare still, for the KCCUK‘s Year of 12 Directors is on the programme as well with Song Hae-seong (송해성) being the man of the month. November is here and I want some fog pretty please. And snow for my birthday – that’s on top of my wish list every year, but in this country it’s always a wish unfulfilled (in my native one, sometimes I get lucky, sometimes I don’t). 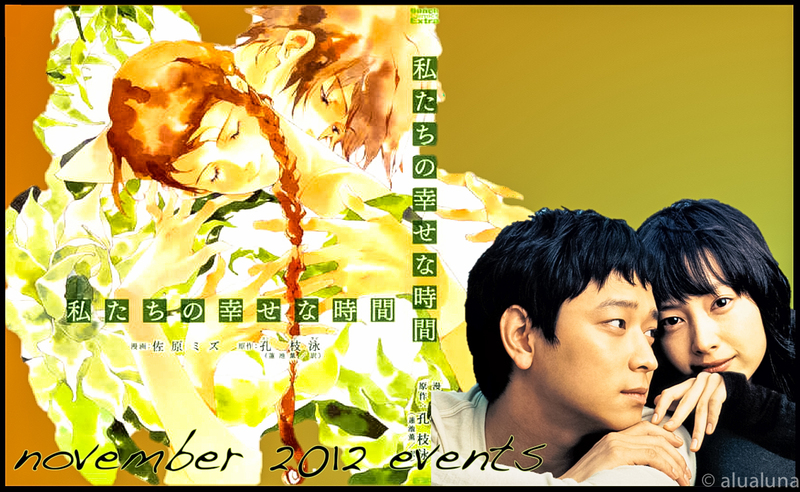 Events are winding down a bit after the super-intense month of October (Raindance, BFI Festival, Scotland Loves Anime, etc. )… or maybe it’s just because I’ll be missing out on some of them that the month doesn’t feel quite as overwhelming, for quite a few events are scheduled, including the ever-bigger London Korean Film Festival and the Leeds International Film Festival. Note 1: This page will be updated as more information becomes available. If you see anything I have missed, do alert me to it! 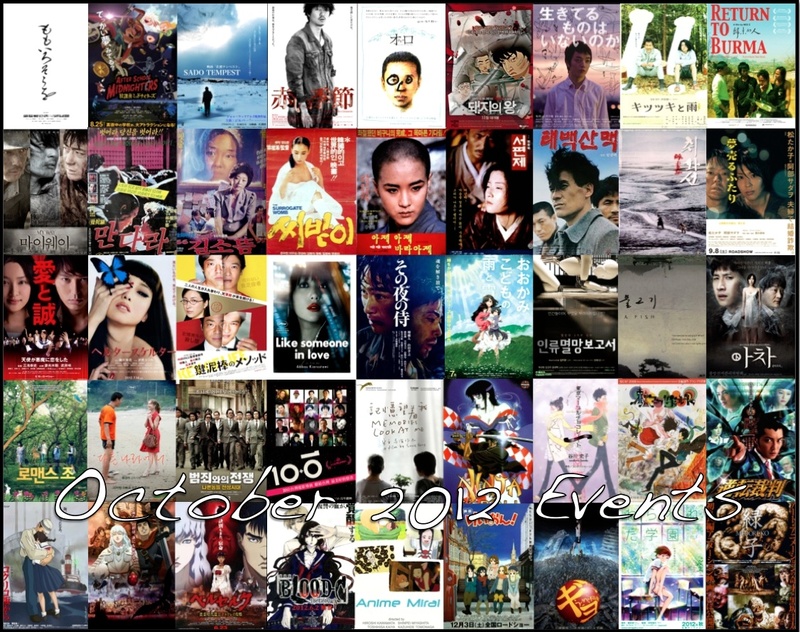 Note 2: This month’s Events image is inspired by 우리들의 행복한 시간 (Woorideuleui Haengbokhan Sigan/Maundy Thursday aka Our Happy Time, 2006), which will be screening at the KCCUK. Originally a Korean novel, it became a (Japanese) manga (「私たちの幸せな時間」/Watashi-tachi no Shiawase na Jikan, 2007, by Sahara Mizu aka Yumeka Sumomo) as well as the Korean film. Seen at the VUE cinema as part of the Jeon Kyu-hwan (전규환) month of the KCCUK’s Korean Film Night programme “2012: Year of the 12 Directors”. Note: This film is rated R and contains graphic imagery. The film festival season gets into full swing (this month’s cover image should give you a visual impression of the deluge of films coming our way): Raindance continues, the madness of the UK’s biggest film event – the London International Film Festival – descends upon the capital, to be followed by the most comprehensive Im Kwon-Taek season that we have probably ever seen in this country, while J-animation fans get their fix up north at Scotland Loves Anime. Let’s hope we’ll all still be breathing when the month is over! Note: This page will be updated as more information becomes available. If you see anything I have missed, do alert me to it! 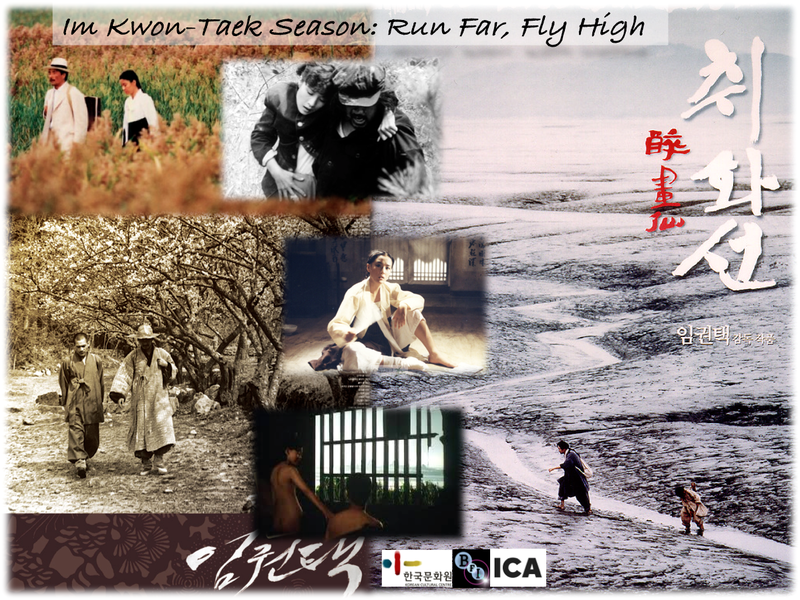 Well, here’s another benefit of having recently become a BFI member: their monthly guide came tumbling through the mail box this dreary-wet morning with details on an upcoming Im Kwon-Taek season. Seen at the Apollo Cinema (Picadilly Circus) as part of the Lee Yoon-ki (이준익) month of the KCCUK’s Korean Film Night programme “2012: Year of the 12 Directors”. September means that the film festival season is starting, with the Zipangu Fest and the Raindance Independent Film Festival kicking off first. There are of course festivals all year round, however, it just seems that autumn brings particularly many and particularly big ones in short succession of one another. 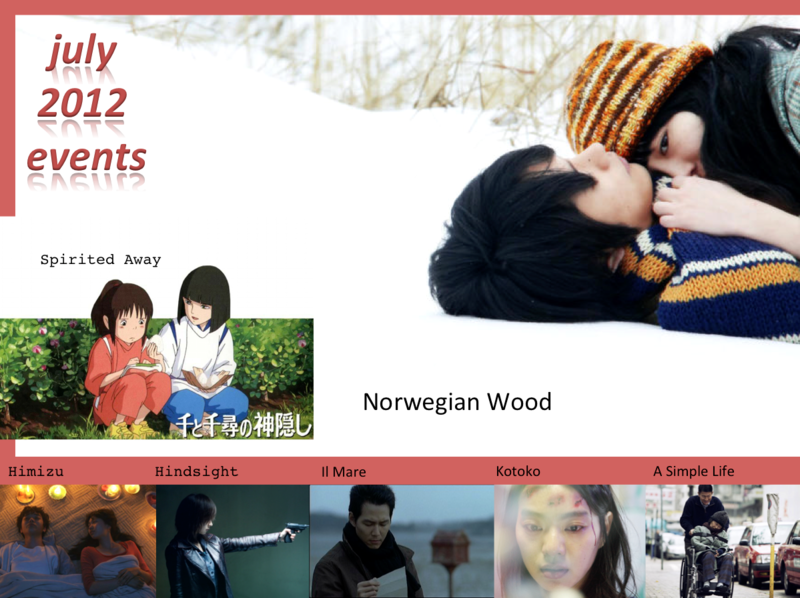 It’s a busy time for us Asian and world film lovers. I am away in India all this month, so you will have to enjoy these screenings for me. Apologies for the post being a day late – it does mean some events are over already – but airplanes still are lacking behind in offering internet services (heck, didn’t I even have a power point at my seat!). There doesn’t seem to be all that much on at the moment. I guess the Olympics are entertainment enough? But I think this bit of ‘cinematic quiet’ is not all that bad as September and especially October will bring a deluge of film festivals, including some of the UK’s biggest. UPDATE 2/8/2012: Might have to eat my own words – at least for fans of terror and horror, all kinds of things are being screened. Juuuuust posting this in time before Sunday is over – I had nearly finished the Trailer Weekly a few hours ago, but then a Japanese friend of mine came for dinner and I was (happily) distracted for a while, enjoying lovely company and yum food (oven grilled summer veg from the farmers’ market + couscous with sour cherries and pistachios + Korean style edamame & cucumber salad + cherries + Greek coffee). This week’s Trailer Weekly begins with lots of USAmericana (including some big budget films), but trailers from Japan and Korea follow as well. As August arrives and the world comes to London for the Olympics, so does the cinematic vision of Lee Yoon-ki, the KCCUK’s director of the month. Like always, there are four film screenings to look forward to, which I am all going to miss out on except the last one (I will be out of country). 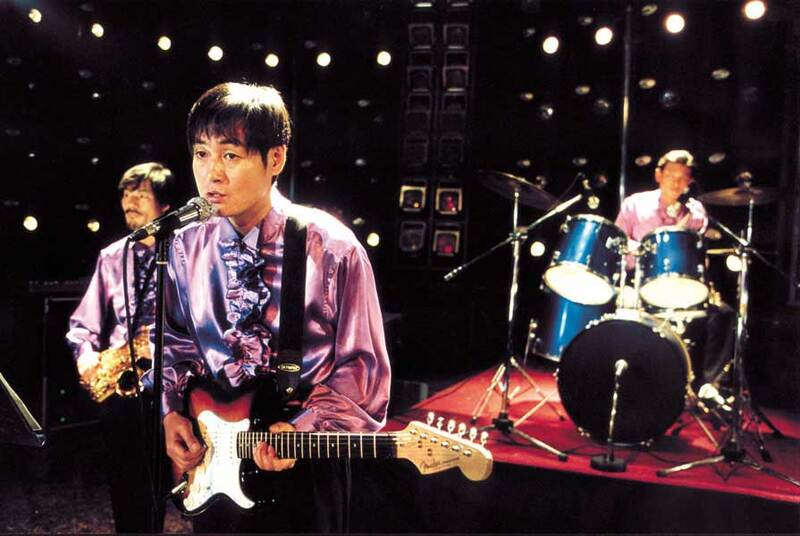 That last one – 사랑한다, 사랑하지 않는다 (Saranghanda, Saranghaji Anhneunda/Come Rain Come Shine, 2011) – I have been wanting to see so much that I gave up on an extra week or two that I could have still spent away and booked my return flight to arrive, just in time, the day before the screening plus Q&A. Yes, that’s the extent of my K-film addiction. Seen at the Korean Cultural Centre (KCCUK) during the Lee Hyun-seung (이현승) month of KCCUK’s Korean Film Night programme “2012: Year of the 12 Directors”. 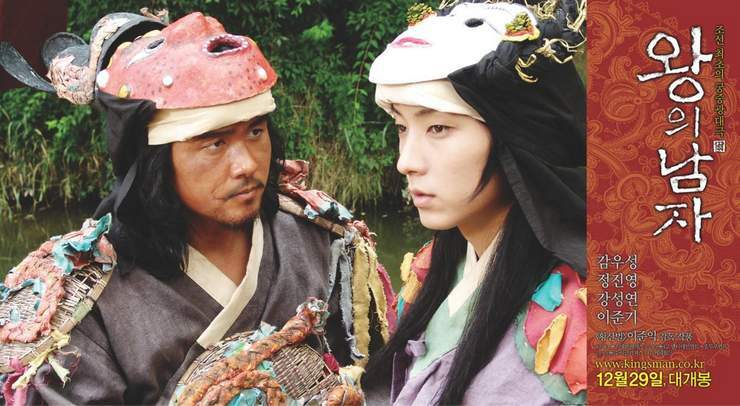 Geudaeanui Beulru isn’t the kind of film that is instantly likeable. You will most probably find yourself feeling lost in its first 15-20 minutes, which are a fast-paced flash of bright images, often oddly monochrome – not, as one might initially presume, because the film’s physical quality has decayed over time. As little is explained and no narrative thread is yet obvious (even if the same faces repeat on the screen), what is happening – and where it is all going – is not clear at all. 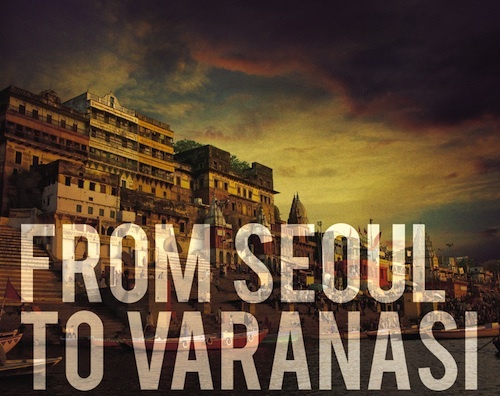 Only when Yurim (Kang Soo-yeon) moves in with Hoseok (Ahn Seong-gi), does a storyline begin to emerge. Seen at the Korean Cultural Centre (KCCUK) during the Lee Jun-ik (이준익) month of KCCUK’s Korean Film Night programme “2012: Year of the 12 Directors”. The review is about the extended version of the film, not the theatrical release. With May nearly upon us, it’s time for an introduction of Jeon Kye-soo (전계수), the KCCUK’s K-director of the month. NOTE: This post has been updated (10-05-2012) as the one of the films planned for May 10th has been added to the May 24th screening (due to refurbishment of the KCCUK I believe). The screening of A Perfect Day (no further information is available on this film, but I presume it is a short) seems to have been cancelled.